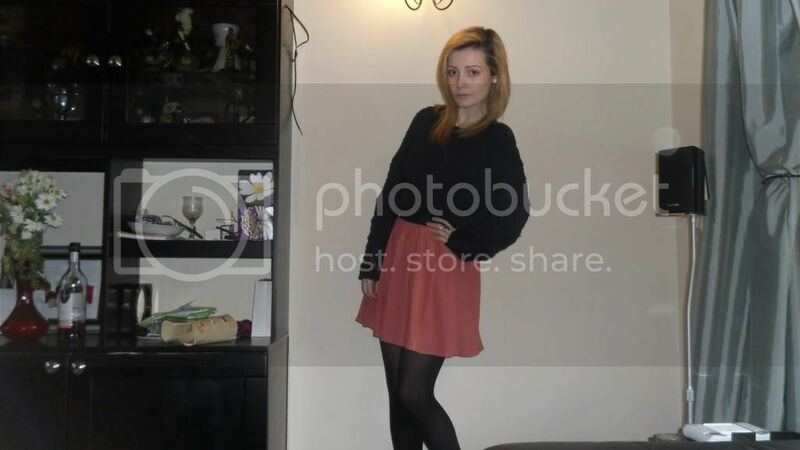 tunic + skirt + tights + ring: Topshop. I love this skirt. Most likely one of my favourite pieces in my wardrobe. The coral colour is so fun & girly, the fact that it's floaty means i actually feel comfortable wearing it without worrying about what my thighs look like 24/7. This tunic is so warm and snug, and i thought it would look good tucked in as to hanging loose. Even though it was pretty sunny(ish) today, i was so so so cold and my lips turned blue! I'm still freezing now, so this worn over a long sleeved top was alright, when i went out though i grabbed my chunky coat too, yeah was still freezing! Hate feeling the cold so easily!! I think how i feel is written all over my face in these photos too, which i must apologise for. Randomly wanted to burst into tears all day, feeling pretty low for no apparent reason. I love Ebay at the moment, in the last few weeks i've managed to bid & win some amazing items. A purple H&M tunic, a striped pair of shorts, check shirt, a cream tunic & snood from Topshop and a ruffle layered skirt from River Island. Pretty successful! I've bid on this cream pussybow blouse which ends in a few days, and i really hope to get, i've been wanting a cream pussybow blouse for absolute ages and just haven't been able to find one anywhere! Plan to raid some Charity Shops this weekend too and hope to find some nice bargains. Also i hope to find either on Ebay or in a Chairty Shop a pair of denim shorts, cupro shorts, scallopped hem shorts & a ponte skirt. So be on the lookout for me guys! So, i know it was nearlly a week since Mondays Glee epsiode, but i need to express my new love for Gwenyth Paltrow! I've always thought she was exceptionally beautiful, and if you saw her in the Glee episode, you'll see what i mean. She's ever so talented too, her voice truly did shock me, i never knew she could sing like that. AH-MAZING! Her cover of Cee Lo Green's 'Never Forget You' was amazing, but when Gwentyh Paltrow sang a duet with Matthew Morrison (who plays Mr Will Schuester) of two amazing songs i actually got goosebumbs. They put the songs 'Umbrella' by Rihanna, and 'Singing In the Rain' by Gene Kelly together and created a masterpiece! Singing in the rain used to be a favourite song of mine when i was younger, if it was raining and i was out with my Dad i used to run down the road with him jumping in puddles singing it, just like he does in which you can see a video here. To see the Gwenyth Paltorw & Matthew Morrison version, you can click here.. get ready to be amazed, i personally think it's amazing! 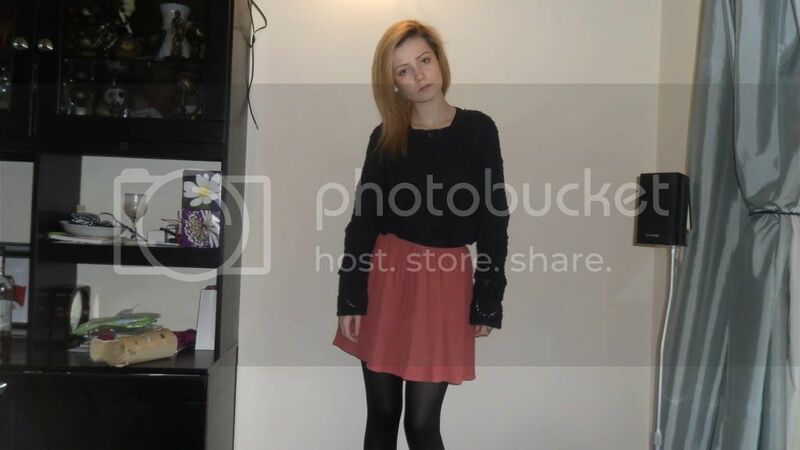 I really want that skirt and love the way you've styled it! Cute! I love ebay as well, so many bargains! Gwenyth is gorgeous, though I don't really like anything she's been in. Love the coral skirt, it's a lovely colour for this season. you look so good in that skirt! the color of it is perfect for you! love the chunky sweater with a shorter skirt, gorgeous! That skirt is just lovely! Im looking for a blue one like that. :) And ebay is the best sometimes! Also, I am a fan of Gweneyth too! Your skirt is really cuuute! 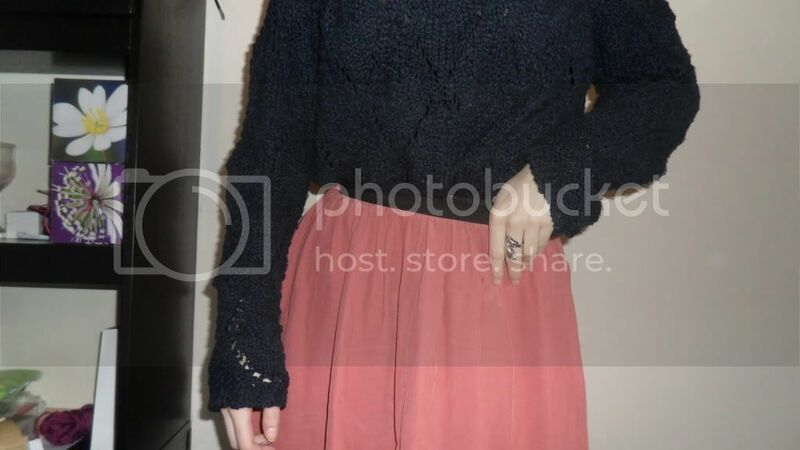 I'm really liking the sweater in your skirt:)! Love this outfit! That skirt is seriously adorable. I love that color!! I love the colour of that skirt!